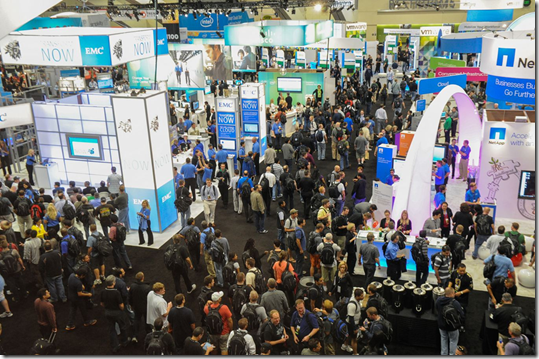 So, VMworld US 2015 was my first time being able to experience VMworld first hand, and not by streaming keynotes and watching recorded sessions months later. As a VMUG Leader, I’ve experienced VMUG Meetings and UserCons before (both as a leader and a member) but this was a whole different animal! 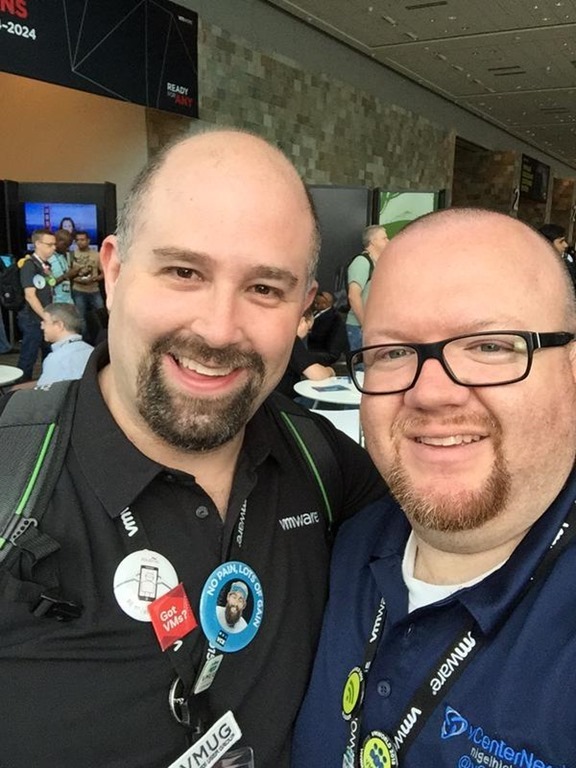 First off, I have to credit my brother, Matt, for helping to guide my VMworld experience, introduce me to different VMworld regulars, recommend places to go, things to do, etc. 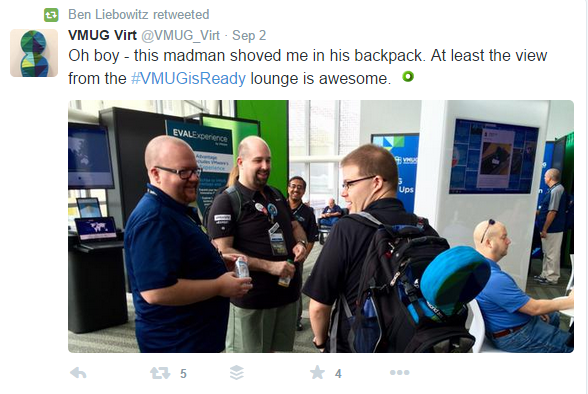 I also have to thank VMUG Headquarters for sending me! I arrived on Sunday afternoon and went to my hotel. My room wasn’t ready yet, but I was able to drop off my bag. I met my brother for lunch nearby at Maetron. 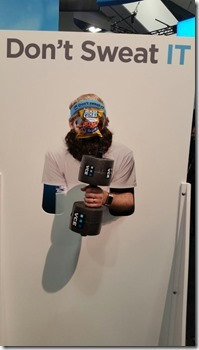 He introduced me to his friend Tim, who he has hung out with at every VMworld he’s attended. We had a quick bite to eat and headed over so I could register. We decided to go to Moscone South to register (they had registration at both South and West) as the Solutions Exchange was there and would be opening up later on. Only, we find out, that materials pickup was only at Moscone West. So we took the quick walk over to West, and I was able to grab my backpack. 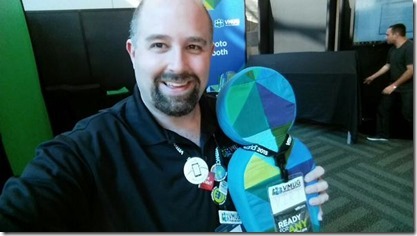 We split up and met back at Moscone South just before the Solutions Exchange opened. The Solutions Exchange area was massive. I’ve seen large ball rooms with vendors setup before, but this reminded me of the Javitz center in NYC! The booths were massive, with giant signs hanging from the ceiling. Some even had a 2nd level! I wish I had thought to take pictures. 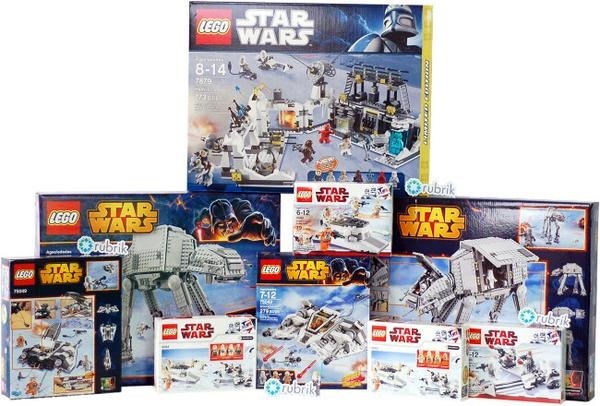 I grabbed a couple that I found online to give some perspective to the size of the Solutions Exchange and the amount of people in attendance! Hell, I may be in one of these pictures! Sunday evening, I had dinner with Matt, Tim and Matt’s coworker and friend from back when we used to work at CompUSA together, Dave. It was good to relax after a long trip and talk about technology, conferences, users, etc. 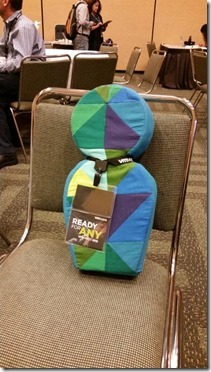 Monday morning, I went straight to the VMUG Lounge in Moscone West to pickup VMUG Virt! Virt is the VMUG Mascot and I was designated his guardian for the day on Monday. My task was to bring Virt around, take pictures of him doing different things, and post them on social media. 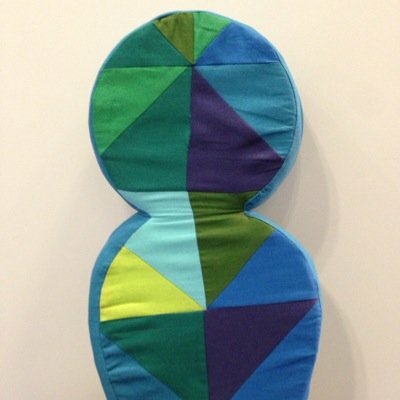 This is a picture of VMUG Virt! My first stop on Monday morning, was the PernixData Breakfast for people awarded with PernixPro or PernixPrime. 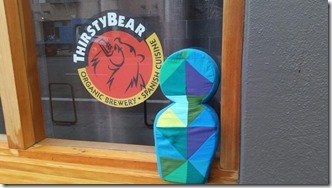 This was at the Thirsty Bear pub just past Moscone South. This was Virt’s first visit somewhere, so I had to grab a picture of him with the sign to mark the occasion! There I met with PernixData Sales Reps & Engineers from all over the country, PernixData users, other VMUG Leaders, etc. It was a great networking event, even if they did run out of food and had to run to the store for more! 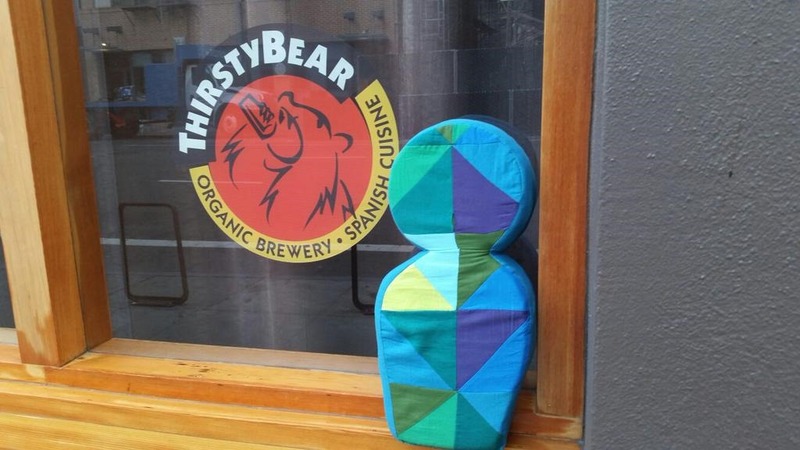 Here is a picture of VMUG Virt outside the Thirsty Bear! 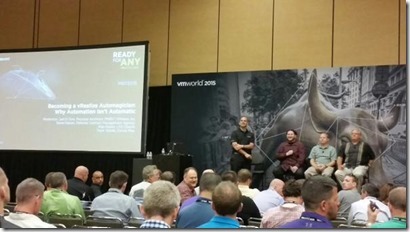 Next up was the VMworld 2015 General Session. 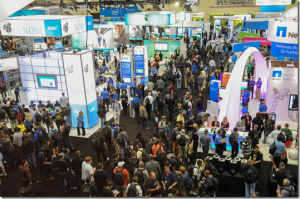 This is held in the big hall in Moscone North. 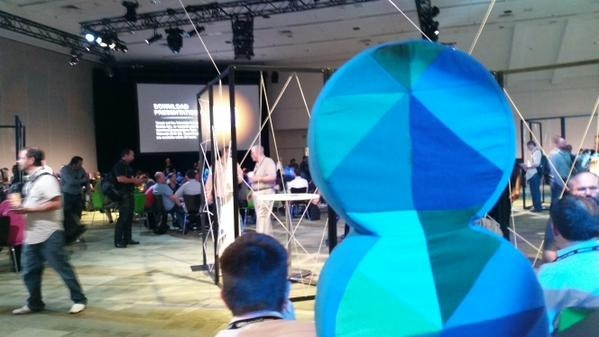 However, many people go to the HangSpace in Moscone North to watch it on the big screens setup there. While my brother says this used to be a well-kept secret to view the Keynote, it’s become a very popular one. It was tough to do, but I managed to find a seat and meet up with my brother and some friends. The keynote was interesting to watch live (somewhat). 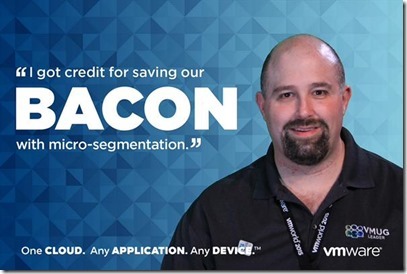 The demo of performing a vMotion between datacenters was great, and the fact that you can now perform a vMotion between your on-premises datacenter and vCloud Air is just amazing! VMUG Virt got to take a picture here also! Also setup in the Hangspace, along with ping pong/pool tables, refreshments, the EVO: Rail challenge area, was the VMware Snaps photobooth. Here, you could take a picture in front of a green screen and in the background they would add one of 8 slogans. 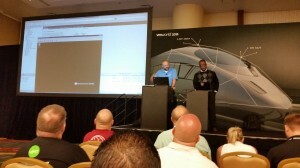 Here are the pictures taken of myself and VMUG Virt. Being a bacon aficionado, I had to choose Bacon. 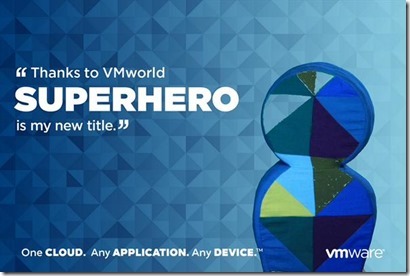 Virt had to be a SuperHero! Although I had booked up my schedule full of sessions to take, I ended up skipping some of them to either walk the Solutions Exchange floor, take a break in the VMUG Lounge, or just take some time to decompress… The first session I attended was Take Virtualization to the Next Level: vSphere with Operations Management. 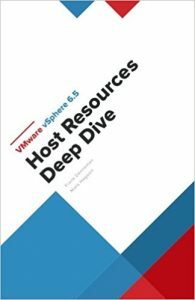 This was a good session from Martin Yip and Himanshu Singh. 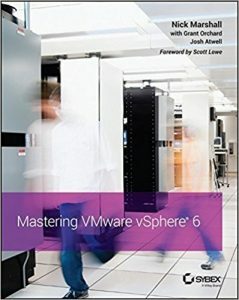 As my company recently purchased VSOM licenses instead of normal Enterprise Plus Licenses, this was an informative session on things that we’ll be able to do with Operations Management. Here’s a picture of VMUG Virt waiting for his (and my) first session to start! 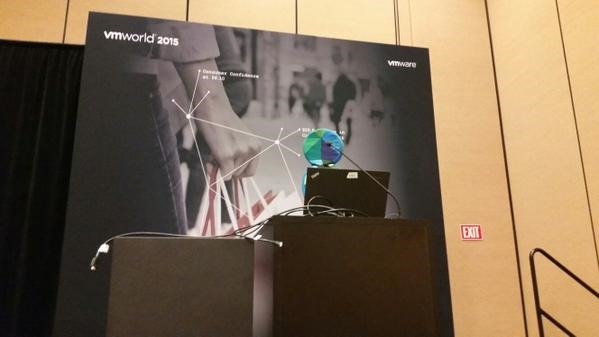 You’ll notice that I went to the Registration desk and got Virt a blank VMworld 2015 Badge! 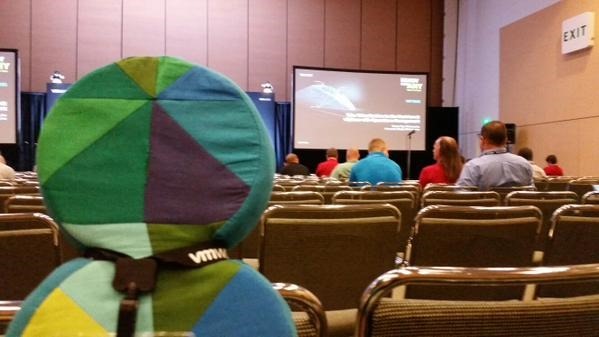 While they worked with the VMworld AV staff on what turned out to be an issue with the IP Confirmation on Deji’s laptop, Virt got up on stage and pretended to be a guest speaker. After that, I went and walked the Solutions Exchange floor a bit. I got to meet with several vendors, get contact info not only for myself but to bring new sponsors into my VMUG group! 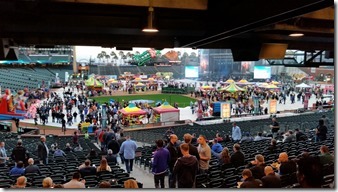 Several vendor booths were always packed, like PernixData and Rubrik! 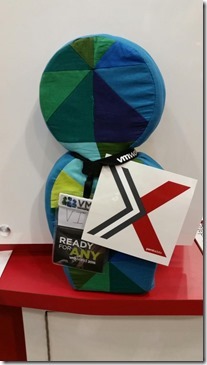 PernixData had a contest to give away a pretty nice Home Lab. To win, you had to tweet a picture of yourself with the PernixData logo… See my entry below. 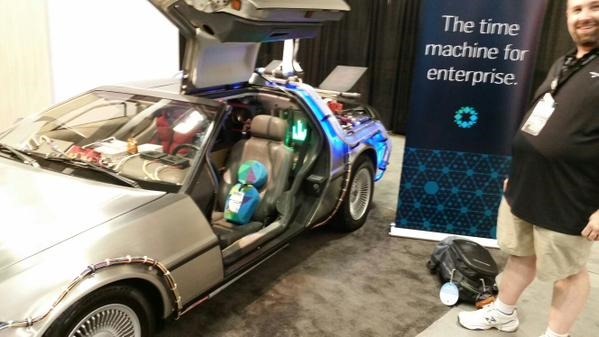 Rubrik had a great idea to bring the Delorean from Back to the Future (complete with Mr. Fusion) and allow people to sit in it for photo ops! 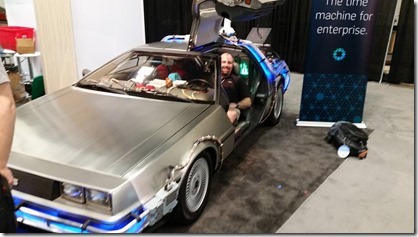 See pictures of both VMUG Virt and myself going… BACK TO THE FUTURE!! 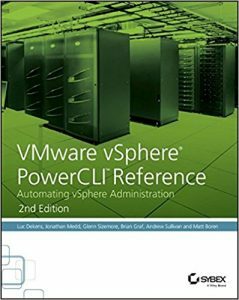 One of the next sessions I attended was at over in the Marriott… vCenter Server Appliance (VCSA) Best Practices & Tips/Tricks. This was a great session by William Lam. Although I’m not using the VCSA in any of my environments currently, it was good to see as I could see us using the Fling to migrate to it eventually. 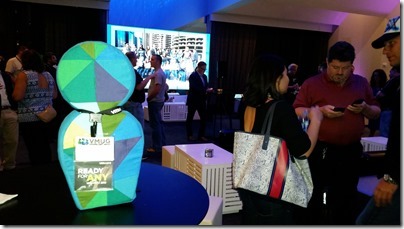 After the sessions, I had 3 evening events on my calendar that I was going to attempt to make… The first one was the VMUG Leader Reception, at the W Hotel. This was a very nice gathering with some entertainment, a booth where you could take a 10 second video in front of a screen and they printed out a flip book out of it, drinks, food, etc. 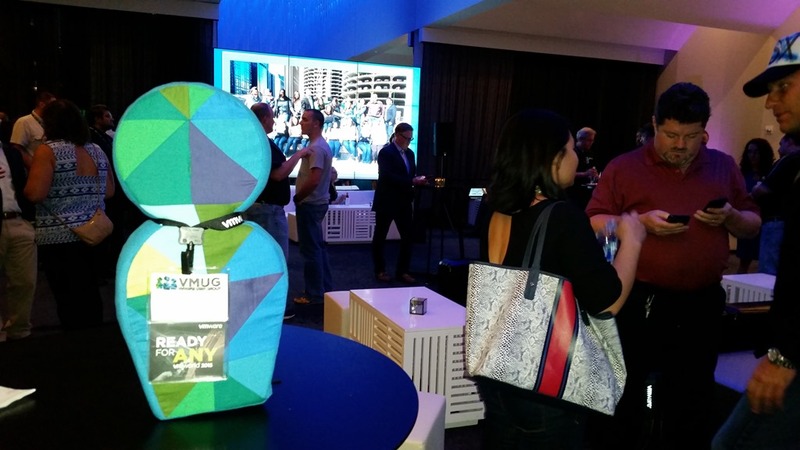 It was really great to be able to network with fellow VMUG Leaders from all over the world! VMUG Virt also got to take a picture here. 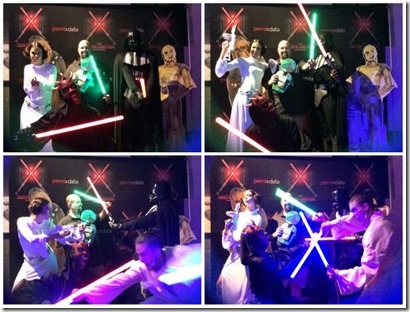 Then, we (Virt and I) went to the PernixData: The DataCenter Awakens Cantina party, about 2 blocks from the W Hotel at the Minna Gallery, and it was packed! I managed to get to the back where they had people dressed as Star Wars characters and you got to pose for pictures with them. It was too crowded for my liking so after taking some pictures with the characters, I headed out. 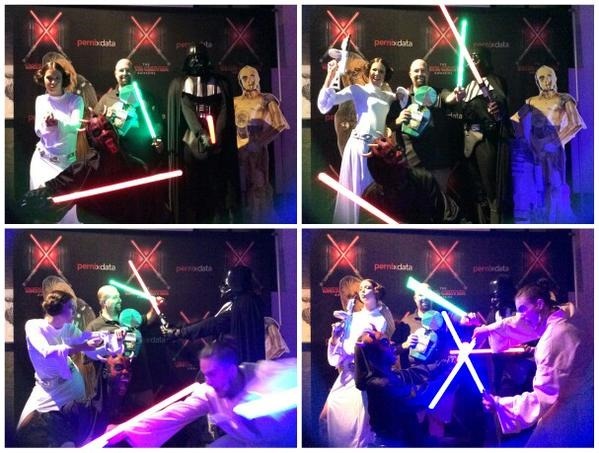 Here is me at Virt battling Darth Vader and other characters below! The last event on my list was the vBrisket event over at SouthPaw BBQ & Southern Cooking. However, this was a bit of a walk and my feet were already ready to fall off, I decided to just go back to my hotel and crash for the night. 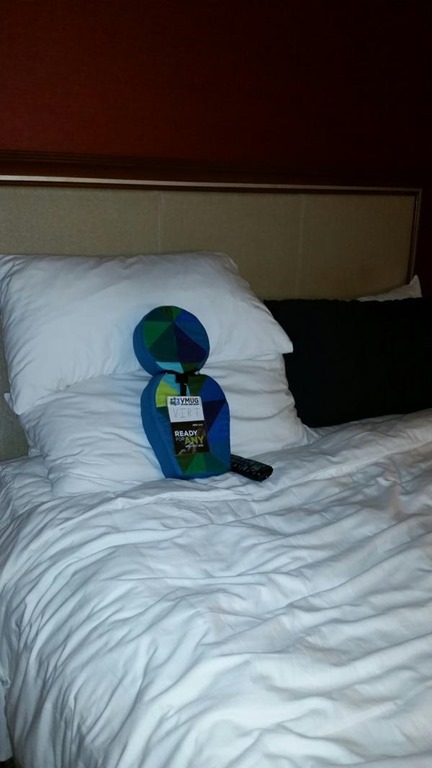 VMUG Virt decided to watch some TV before bed. On Tuesday morning, I met up with Greg, one of the leaders of the NYC VMUG group, in order to hand off VMUG Virt as Greg was his keeper for the day on Tuesday. After meeting Greg in the lobby of the hotel, I went to grab breakfast over in Moscone West and then headed to the Hang Space to meet my brother to watch the Tuesday morning Keynote. Thankfully, this time it was much less crowded and we were able to find a spot to sit and comfortably watch. This was a good keynote, with a surprise speaker from Microsoft talking about Windows 10 and using tools like Airwatch to manage it. Pat Gelsinger is also a very good, powerful speaker. 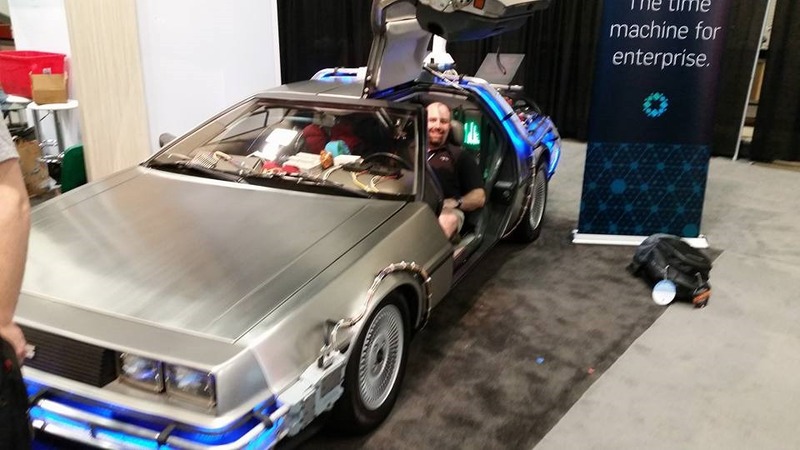 You can tell he has worked in the Tech field a long time and still gets excited at new advancements. After grabbing lunch and stopping by the VMUG Lounge for a while, I went to what ended up being one of my favorite sessions of the trip. 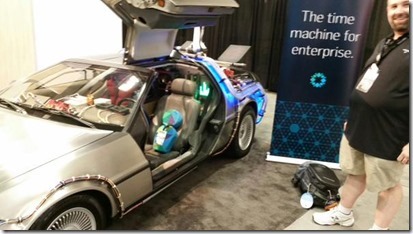 Becoming a vRealize Automagician: Why Automation isn’t Automatic. This was a session led by Jad El-Zein. He moderated a panel of 3 engineers from 3 different companies who talked about how they implemented vRA and how they used it, what issues they ran into in their journey, etc. Being a VMUG Leader, I always like to see the customers talk about the products and how they use them and that’s exactly what Jad brought us here. Great job guys! 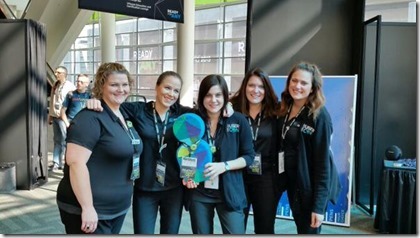 After this session, I went back and wandered around the Solutions Exchange, again looking for info on new vendors I was not aware of, and potential VMUG sponsors for my local group in New Jersey. 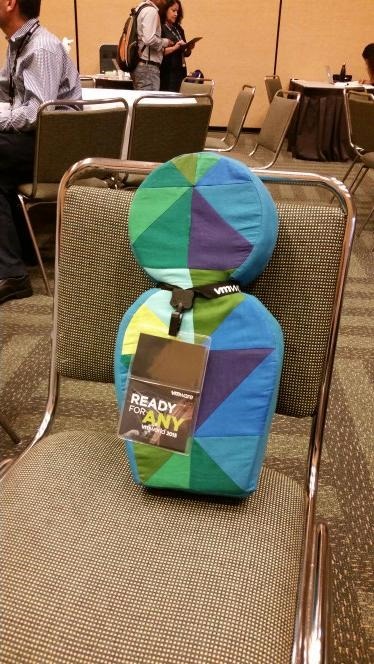 VCE was giving away something, at this point I forget what, but to win you had to tweet yourself with your face in this stand-in… the person in front of me used a stuffed animal in her picture, and the guy said I had to beat that… all I had in my bag that wasn’t something from another vendor was my bag of pretzels! Needless to say, my pretzels didn’t win. Tuesday night was the vExpert party at the Julie Morgan Ballroom, about a 20 min walk from my hotel. I walked over to my brother’s hotel and we took a cab over together along with Tim. 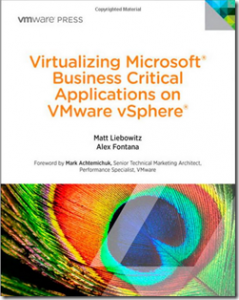 As we pull up, we see someone in a VMware shirt at the curb next to a bunch of boxes. He recognized our badges and asked if we were going to the vExpert event. We were recruited to carry some boxes up, so we each grabbed a box, signed in at the front desk and up we went. 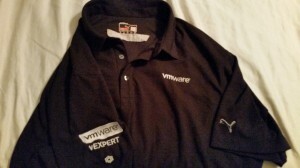 The boxes turned out to be VMware vExpert Polo Shirts sponsored by vCloudAir. 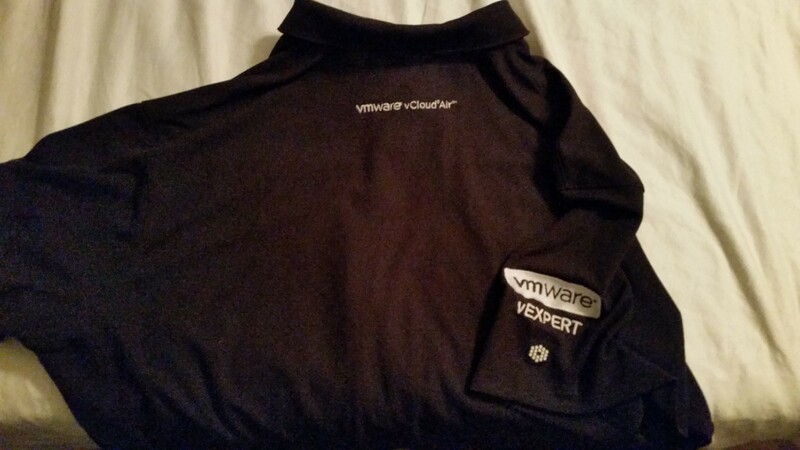 The party was fun and we got some good info about the vExpert program, how it’s growing, etc. After grabbing dinner at a Japanese place we found near the vExpert party, I took a cab back to the hotel and crashed! 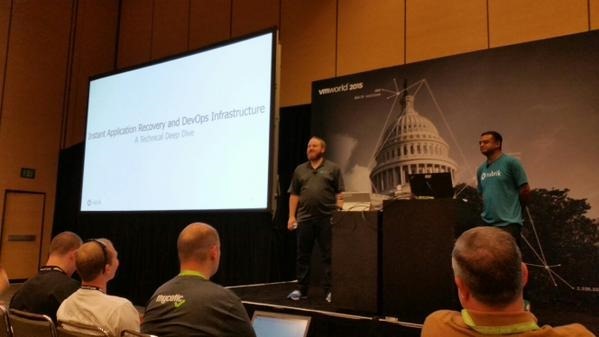 Wednesday morning, I grabbed breakfast and headed over to the session Instant Application Recovery and DevOps Infrastructure for VMware Environments – A Technical Deep Dive. This was an in-depth look at Rubrik’s Converged Backup Appliance by Chris Wahl & Arvind “Nitro” Nithrakashyap. I’m a big fan of Rubrik’s Converged Backup Platform and what they’re doing for the backup space. 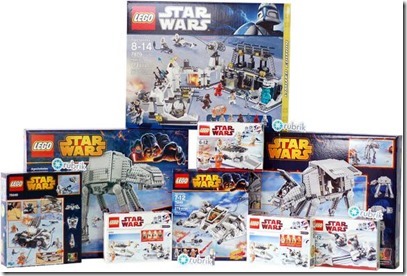 At the beginning of the session, they handed out raffle tickets and at the end of the session, picked a winner for this awesome Star Wars Lego collection. I WON! After the Rubrik session, was the VMUG Leader Luncheon at the Marriott. This turned out to be a great event, as I got to meet a bunch of other leaders, talk to them about how they find sponsors, how/when/where they run their meetings, etc.  At the end, it turned into a roundtable discussion to go over issues we’re having as VMUG Leaders and how the other leaders or VMUG HQ could help! 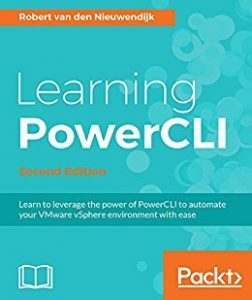 I got some great suggestions out of this to bring back to my VMUG group! Here a group shot with all the VMUG Leaders, with VIRT hidden in the middle! I’m in the front row on the right side. 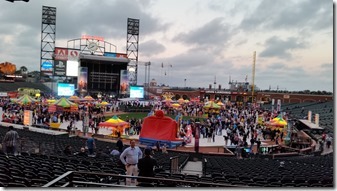 After that, I headed over to the VMUG Lounge to relax before going back to my hotel to crash for a while before the VMworld Party at AT&T Park. While at the lounge, I ran into Nigel Hickey, fellow VMUG Leader (Houston VMUG) & Author of the vExpert Spotlight blog series! It was great to meet Nigel and learn he was originally from New Jersey! 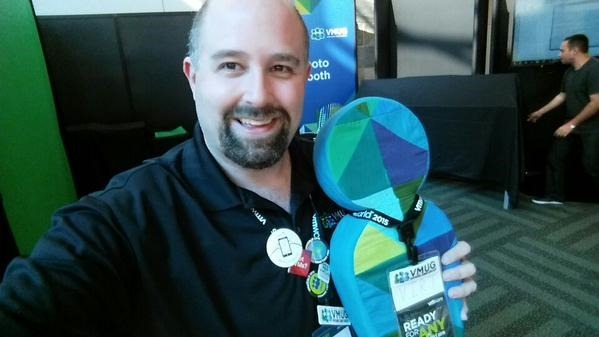 Below is the selfie Nigel took of us, as well as Steve Athanas with Virt shoved in his backpack! After texting back and forth with my brother about how I was thinking about bailing on the party, my brother convinced me to go and we met up outside of Moscone West to catch the buses to the event. 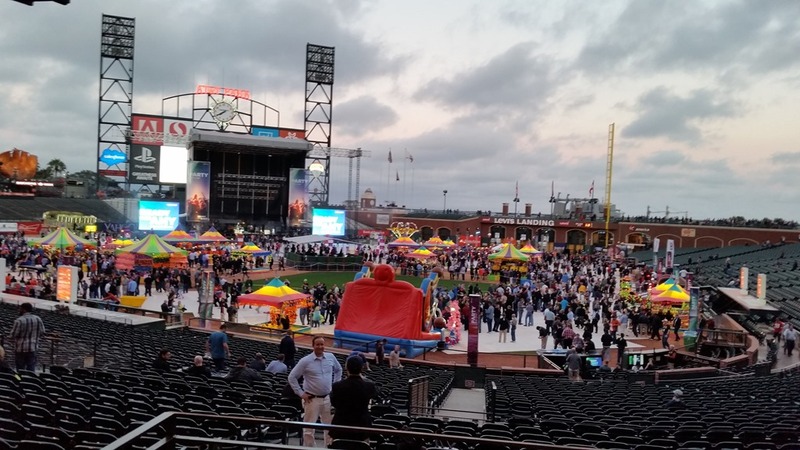 The event was billed as “Full Access to AT&T Park with headline entertainment by Neon Trees and Alabama Shakes.” When we got there, what we found was amazing! 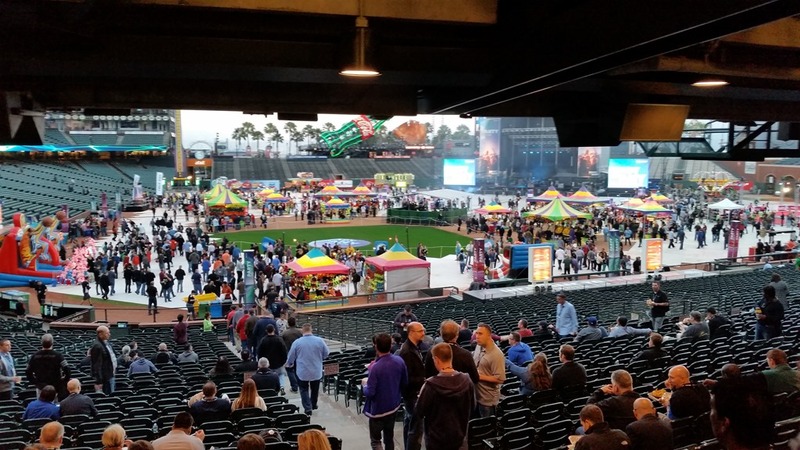 All the concession stands were open and FREE, as well as carnival booths setup down on the field where you could play games and each win won a prize! All while the band(s) played on the stage. It was a great time and I’m glad I went! I even managed to win a stuffed animal (a pig of course) to bring home for my son (18 months old at the time), Shane! Thanks Matt for helping me to win and staying in line to play over and over and over again until one of us won! Thursday morning, I packed up my bags and headed over to Moscone West to drop off my luggage at the bag check and have breakfast. I met my brother and we hung out in the lounge area on the 2nd floor instead of heading to the General Session. I headed over to the VMUG Lounge to work the booth until it was time for my to head to the airport at 1pm. 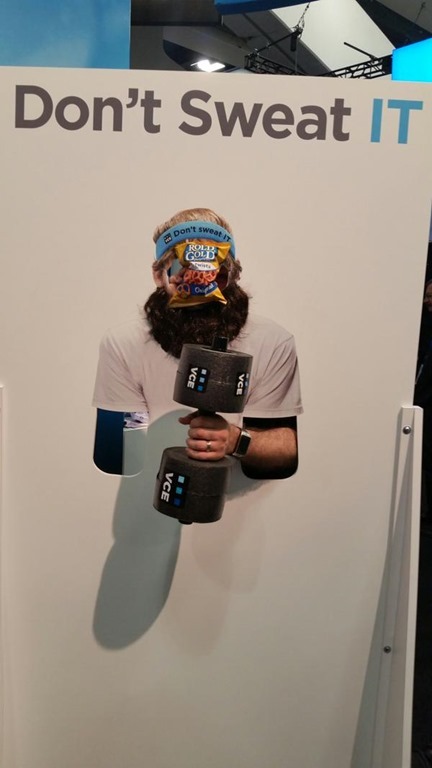 While at the lounge, I got to hang with VMUG Virt for a bit again, I manned the VMUG Plinko board (which ended up being me doing squats for 2 and a half hours, which I paid for with sore leg muscles for a few days!) 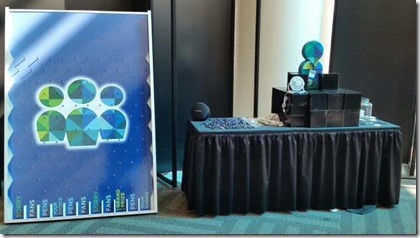 On the Plinko board you could win a Pen, a Pin, a Patch, a VMUG USB Fan, or the grand prize (an entry into a contest for a $500 travel voucher). It was fun and enabled me to meet a lot of the VMUG Members and other VMUG Leaders! Before I left to head home, I got a group shot of VIRT with the VMUG HQ Staff! Overall, I had a great trip, met a lot of people, learned a few things, and was able to network a bit for my local VMUG group in New Jersey. 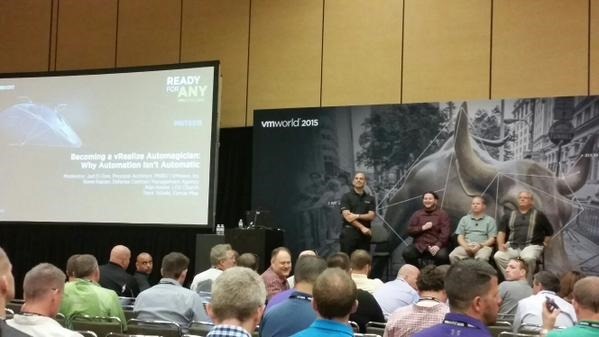 I hope I’m able to return again next year at VMworld 2016 Las Vegas! Sorry I missed you last year! 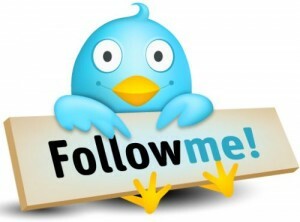 Hope we both get to go this year and we can meet. 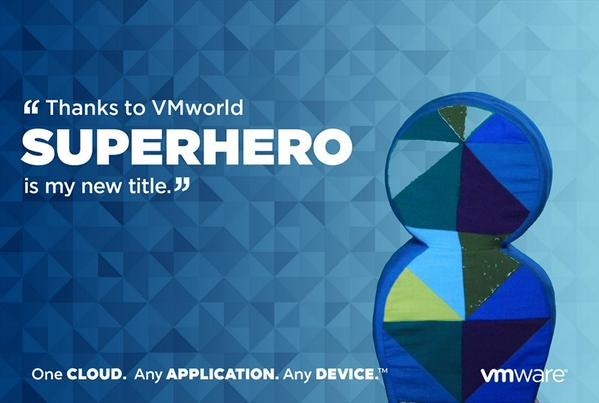 Everyone’s VMworld experience is different! I was lucky to have experienced Peoria like my brother to help guide me!